Retired Gen. Kathy Thomas encourages attendees at a recent Volunteers of America luncheon to give generously to the organization. The event was held in October at the DoubleTree Hotel. 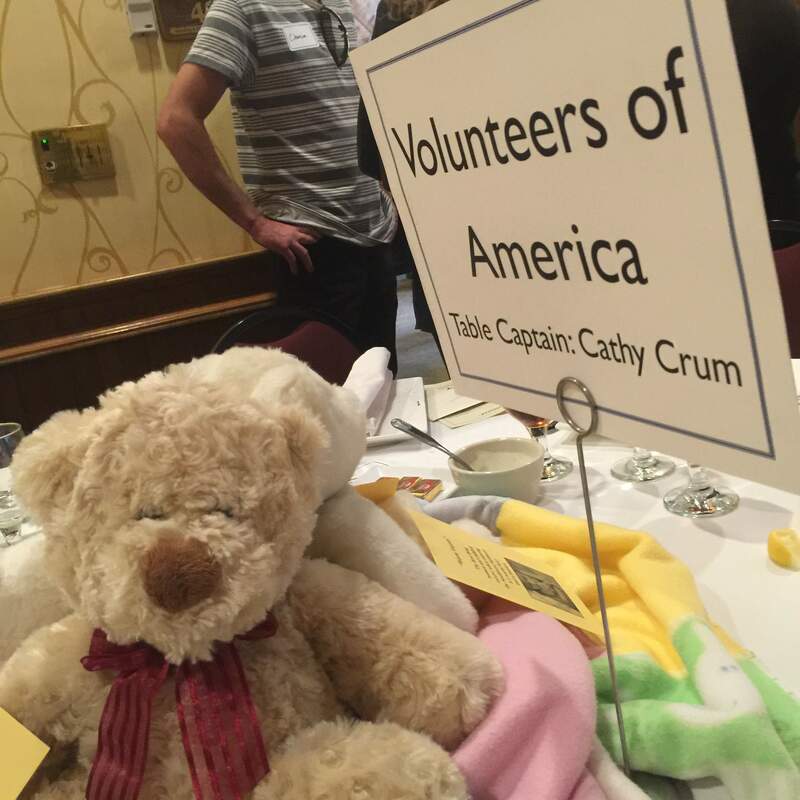 “Warm and fuzzies’ are the first thing given to children who arrive at the Durango Community Shelter or Southwest Safehouse to help them with the transition, so warm and fuzzies were the centerpieces at a recent Volunteers of America luncheon fundraiser at the DoubleTree Hotel. It would be easy to look at the Durango Community Shelter or the Southwest Safehouse simply as safe roofs over the heads of people in our community who are struggling. But the two Volunteers of America-run facilities are really life-changers. At Shelter from the Storm, a luncheon in October at the DoubleTree Hotel, the organization told its story and asked clients to tell some of their stories too via video, a slideshow and personal testimonials. Between hard statistics and heartwarming personal stories, VOA makes a compelling case for the work it does. And it happens because the Shelter and Safehouse provide longer-term housing with wrap-around support to help people rebuild their lives. Access to services and affordable housing, support in finding jobs, health care sign-up through Axis Health System and, maybe most importantly, warm caring and compassion are offered. The success rate is admirable. In 2015, 96 percent of the women served by the Southwest Safehouse did not return to their abuser. Of the adults involved in the Durango Community Shelter Extended Stay Program, 92 percent obtained stable, full-time employment. Almost 80 percent of veterans served in the Veteran Transitional Housing Program secured safe, stable, affordable long-term housing. In 2015, the two facilities provided 16,712 nights of safe shelter to 729 people, including 400 women and children. Melanie was one of those women. She grew up in a household with a lot of alcohol and abuse, where her brothers kicked her in the head like it was a football. “I grew up thinking that was a normal life,” she said. After running away at 12 and troubled teenage years, she married a man because he was helpful to his family and she thought he would be kind. But she found herself once again in a violent household, only now she had children, and she felt she had to stay with him because of them. Leaving proved difficult. On her fourth attempt, her husband created such a commotion at her new apartment, the landlord canceled the lease. After a Durango Police Department officer recommended the Safehouse, Melanie found the support she needed to rebuild her life. With a full time job and an employer who is willing to pay for her to get her licensed practical nursing certification, as well as treatment for her recently diagnosed bipolar disorder, Melanie is well on her way. A resident at the shelter talked about how being the victims of crime, he and his family had lost their faith in humanity. The staff and other residents restored it. And retired Air Force Gen. Kathy Thomas spoke about the challenges of veterans who return from deployments to combat and peacekeeping missions. The VOA has two programs that help veterans get their feet in civilian life and obtain affordable housing in La Plata County. Kudos go out to table captains Cissy Anderson, Debra Parmenter, Dave Smith, Jane Norton, Mac and Diane Curtis, Kathie Adkins, Sydney Morris, Janice Sheftel, Ted Talmon, Bee and Jim Atwood, Mel and Becky Owen, Sue Johnson-Erner, Janine Crossno, Lauren Wall, Marisa Bates, Pat Wainwright and Tonya Wales. The DoubleTree and FastForward Media along with Basin Printing & Imaging, Kelly Rogers, Lightning Communications and Thomas sponsored the luncheon. More than 200 people attended Storm from the Shelter, thanks to the tireless work of the table captains and volunteers. Contributions made on the day of the event totaled more than $41,000. The total support, including what was committed over the next five years, came to almost $80,000. That will help a lot of people turn their lives around. HHHHow can you support the work the Volunteers of America does? Volunteers can work at the shelter by preparing meals, doing office work or organizing and sorting donations. Or maybe you want to adopt-a-room, taking on the project of painting, cleaning and decorating one of the four rooms dedicated to families. Women in the Safehouse, who are trying to protect and rebuild their families, often don’t have the materials to celebrate special holidays with their children. Gather food, decorations or gifts for the Safehouse. Drives for nonperishables, baby diapers, coats and paper products, items always in high demand – check with them first to see what’s most needed – can fill their supply closets quickly. Hold an event and donate admission fees or ask people to donate nonperishable food items. Create a basket of household supplies for people moving out of the shelter and into their own homes. And of course, the quickest and easiest way to support them is to drop a check in the mail to VOA, P.O. Box 2107, Durango, CO 81302. Donations of $250 or more are eligible for an Enterprise Zone tax credit, and you can also make a multiyear pledge in monthly, quarterly or annual gifts. Call 259-1255 to learn more.